I had the chance recently to ask David about his successful experience coaching students in a business plan competition. This is what he had to say. Earlier this year, the California Business and Entrepreneurship Centers partnered with the world’s leader in business planning, Palo Alto Software, to provide any California community college instructor who taught entrepreneurship (or high school instructor affiliated with a Youth Entrepreneurship Program) with a free copy of Palo Alto Software’s “Start, Run & Grow Your Business” turn-key entrepreneurship curriculum, as well as free LivePlan software (a cloud-based business planning and management tool) for up to 25 students per class to write a business plan. 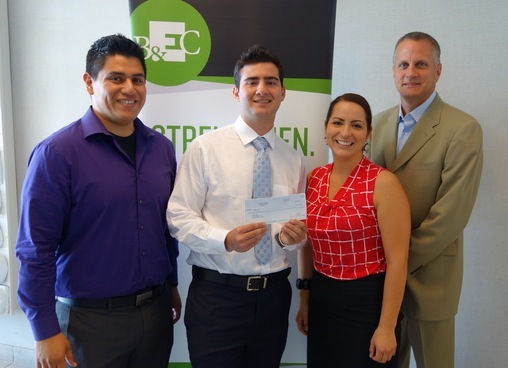 The partnership also included a statewide business plan competition called the “BEC Boost“. It was the state’s first-ever business plan competition. There were three age tracks—14 to 17 years old, 18 to 27 years old and 28 years and older—that each competed to win their age group’s grand prize: $5,000 in cash, plus thousands of dollars worth of in-kind prizes to help them “boost” their business. How many students did you coach for the BEC Boost business plan competiton? I had 13 teams, totaling 19 students. Five of those teams entered the BEC Boost for a chance to win $5,000 cash, plus the in-kind prizes. Two of my students ended up winning in the finalist category. Which of your students won the BEC Boost? Ismael Kotob (age 17) won the 14 to 17 year old track. Ismael was in my class at Villa Park High School. His business is called Secure Alcohol Systems. The idea is to secure coolers in convenience and grocery stores that contain alcohol with magnetic locks that check for date of birth on identification to verify that the person opening the cooler is of legal drinking age. I’m also a coach at the Youth Entrepreneurship Program here in our community, and I coached Andrew Ekelem and Michelle Sangalang. Their business is called Chariot Mobility, and they are working on the first manual wheelchair to be maneuvered solely from a lever system, which gives users a smaller profile and allows for greater efficiency. It’s great that out of the three finalists, two of them were your students. Congratulations! What did you think when you heard they had each won $5,000? I was absolutely in shock! I thought, Wow! I was listening in to the Winners’ Webinar and when I heard that Ismael had won the youth track I was so proud. He worked really hard to win, and it’s nice to see his hard work pay off. He spent hours doing revisions to his plan and took all the feedback he received and made updates. He’s a smart, hardworking kid, and will continue to do great things in life. Then when I heard that Michelle and Andrew also won I almost couldn’t believe it! Especially after hearing that over 600 plans had been submitted. This contest was a lot of fun, but also a lot of hard work. I’m so happy to have been a part of the process, but the wins are the result of their hard work and dedication. This was truly a team effort. I can’t take credit here, there were many others who mentored Ismael and Michelle and Andrew. I’m just happy to have been a part of their success. What was it like to use LivePlan with your students? It was awesome! The students enjoyed having a clear outline to help them build their business plan, and it was great for me and the other mentors to be able to log in and post comments in the sections of their plans that needed more work. How did you hear about the California BEC Boost business plan competition? I heard about the BEC Boost from Mike Roessler (the statewide Director for the Business and Entrepreneurship Center programs and co-host of the competition). I did a small regional competition first. Ismael actually entered our summer 2012 competition—he came in second place, and then afterwards he participated in workshops to get ready for the BEC Boost. I helped him and my other students with hands-on workshops to build out business plans, asking them to think through how they would solve a problem, and coming up with ways to differentiate themselves from competition. How did you mentor your students for the BEC Boost? There was lots of feedback and mentorship leading up to the BEC Boost. I worked with Ismael on a weekly basis to fine-tune his plan, and push him to see things from the viewpoint of his potential customer. I gave him as much support as he needed. He was a motivated student! His confidence in what he’s trying to build has grown so much. He’s dedicated to doing this. It went from an idea to a company! He’s got his parents’ support which really helps. And his ability to follow-through is great. I’ve also helped him connect with other opportunities. He’s getting additional funding. He’s a recipient of a prize from Ernst & Young, and he was chosen as the Orange County Entrepreneur of the Year, which comes with a $1,000 scholarship! Andrew and Michelle of Chariot Mobility both participated in the Young Entrepreneur Program. I started working with them in February 2013 and we went through the same process I went through with Ismael. This mentorship was more strategic in nature, helping them fine-tune their plan. Read more about the winners of the California BEC Boost.